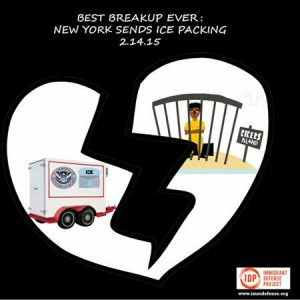 For decades, Immigration and Customs Enforcement (ICE) used its office trailer on Rikers Island, one of the world’s largest jails, as a base for funneling thousands of New Yorkers into a mass detention and deportation machine that tears apart families and violates human rights. On Valentine’s Day, 2015, the Immigrant Defense Project celebrated the #bestbreakupever. February 14, 2015 was the first day that ICE’s office trailer on Rikers Island was officially be shut down. Thanks to years of advocacy by the ICE out of Rikers Coalition and the leadership of Mayor DeBlasio and Speaker Mark-Viverito, in October New York City passed legislation sending ICE packing from Rikers and limiting other City collaboration with federal deportation programs. This breakup helped thousands of families to stay together. IDP and our allies continues to fight to support more of these breakups across the country. In spite of ICE’s recent rebranding attempts, local governments must continue to stand up to mass detention and deportation programs that rely on their collaboration to jail and deport residents without due process, tearing them away from their families and communities. For more info about the legislation, check out IDP and Cardozo Law School’s practice advisory.